Home Great Neck News Why Print Anonymous Letter Against A Candidate? Why Print Anonymous Letter Against A Candidate? As a subscriber to our local papers, I often read the online versions in advance of receiving my mailed copy of the paper. With curiosity, I read the letter to the editor sent in regarding the upcoming Park District commissioner election. Irrelevant is which candidate I will be voting for; I choose to keep my opinion in elections to myself. 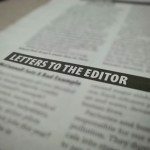 What I find myself needing to address is the irresponsible journalism and lack of editorial integrity exhibited in printing an accusatory, anonymous letter against one of the candidates running for office. If criminal or threatening activities are or have been experienced, then police should be notified and behavior of this sort not tolerated. But we should not conduct a trial by media, which is what took place. This sets an extremely dangerous precedent! As an elected official in this community, I shudder to think that I, too, would be vulnerable to anyone with an ax to grind, allowing someone to assassinate my character through printed anonymous and defamatory accusations and given a voice through your paper. This lack of ethics and irresponsible behavior is to be expected of drivel like the Enquirer, not our Great Neck Record! Read the original letter here. Read the anonymous letter writers’ explanation for why they chose to remain anonymous here. Next articleWhy Publish An Anonymous Letter? Great Neck Record welcomes letters from the community. The views expressed in letters to the editor are not necessarily those of the publisher or Anton Media Group.